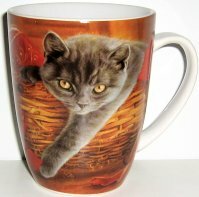 This large Christmas cat mug features a grey cat climbing out of a gift basket. This stoneware mug is 4 1/2" high x 3 5/8" wide across the top (not including the handle). It holds a generous 16 fl oz. Dishwasher and microwave safe. Comes in its own decorative gift box.